Hey everyone! 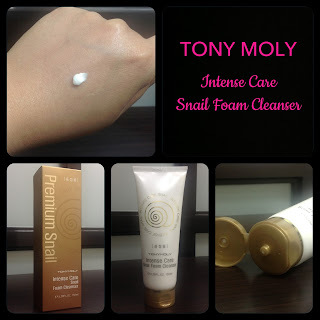 I've always been an avid user of products from Tony Moly since the day they opened a flagship store in Manila. I've been a returning customer (SM North and SM Fairview) since last year because aside from selling high quality products from skin care to makeup, they also have sales representatives who assist you without annoyingly following you wherever you go. A year ago, Tony Moly was on sale for more than a few times so my friends and I stocked up on our favorites. They had a buy 1 take 1 promo on selected Floria lines so I was able to try almost everything like the toner, emulsion, serum and night cream. Good thing about buying Tony Moly products in bulk is they generously give gifts with purchase. I've received sachets of cleanser, facial wash and BB cream but the most memorable and probably the best in my opinion is when they gave me a full size of the Premium Snail foam cleanser. This cleanser comes in a 150 ml squeeze type tube with a flip top hence the product is easily dispensed. The label on the back of the tube is in Korean but the box has an English translation. Glycerin is one of the main ingredients of this cleansing foam which is known for its moisturizing properties. It's a good cleanser that's mild enough to use everyday and is also suitable for those with sensitive skin. It's opaque white and has the consistency of a thick cream. A small pea size is enough to cover your entire face. This cleanser lathers up quickly and feels really smooth and silky on your skin. I actually love its fresh citrus scent and how it makes my skin feel supple after each wash. I never had any adverse skin reactions to this cleanser and it didn't break me out. The price tag stings a bit and may not fit my tight budget, luckily I got another free tube from Tony Moly when I last restocked my Luminous Goddess Aura BB Cream. Overall, I am obsessed with this cleansing foam that I plan on saving money when I'm done with my second tube. Hopefully Tony Moly will still give one away as gift with purchase so I won't have to shell out 848 Php. I highly recommend it to those who want to try a good foam cleanser suitable for all skin types that can keep your skin clean and moisturized at the same time.